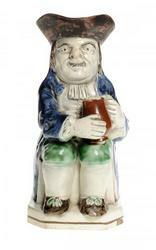 A mid 19thC Staffordshire Toby jug in the form of George Whitfield The Night Watchman, in typical seated pose decorated in colours holding hat and lantern on a marble finish base, 25cm high. 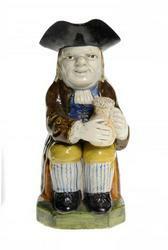 A 19thC pottery Toby jug, formed as a seated gentleman holding a foaming jug of ale with black hat red and yellow jacket, yellow breeches, striped stockings, black boots on a shaped green base, 23 cm high. 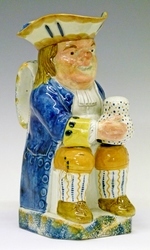 A mid 19thC Portobello style Toby jug, in the form of a seated gentlemen holding foaming jug of ale in blue hat, turquoise and pink jacket and green breeches with striped stockings on a shaped sponged base. 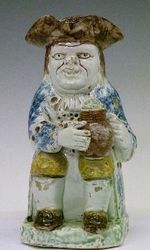 A Victorian Staffordshire pottery Toby jug, depicting a standing snuff taker with black hat and pink jacket with a dotted green waistcoat on a green lined naturalistic base, 24.5cm high. 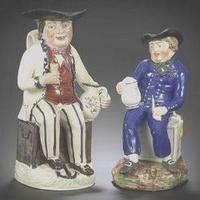 North Country pottery toby jug, circa 1800, his jacket with blue sponged decoration, mottled brown tricorn hat, yellow breeches, brown glazed jug of foaming ale and standing on a green sponged base. 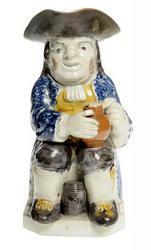 Condition Report: The area of the hat above the figure`s left shoulder has been broken and restored, glaze losses visible to the nose and across the surface of the piece, the yellow of his trousers particularly badly oxidised, the underside shows a 3 pointed star crack. 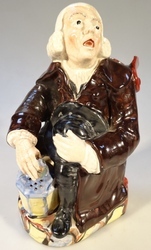 Condition Report: Figure`s hat fully restored with evidence of overpainting and restoration descending down across the face and back of the head. 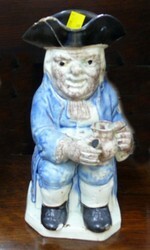 FINE GEORGE III STAFFORDSHIRE BACCHUS TOBY JUG. 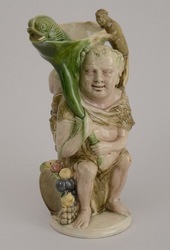 Modeled seated on grape and fruit-draped barrel, wearing a lion skin and holding a cornucopium, with dolphin head spout, flanked by chained monkey handle, the reverse with child satyr. 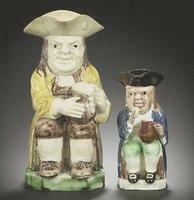 12 1/2 in. 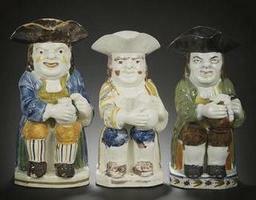 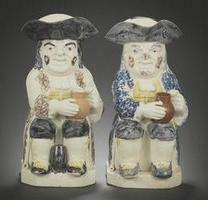 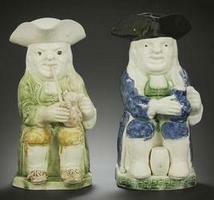 A late 18th century creamware Toby jug, the seated figure holding a jug in his left hand and a pipe in his right, (as found); together with a similar creamware figure group of Vicar and Moses.